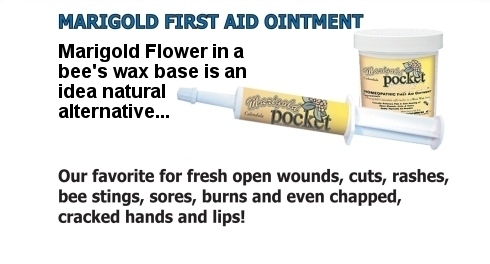 Our Marigold Healer is Marigold Flower (calelendula offinanalis) in a bees wax base is an ideal natural alternative and a favorite for not only fresh open wounds and cuts, but also rashes, bee stings, sores, burns... even chapped, cracked hands and lips! Many even use in the eyes as as protectant and to sooth irritation. Available in two sizes, the jar is great for the office or house. 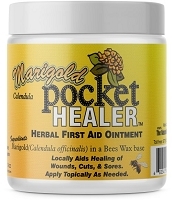 AND one should never leave home without the " pocket healer" size! Veterinarians are amazed at the support it offers. You will too! !